Whimsy, Wit, and Balance: Alexander Calder at the Height of His Career | Skinner Inc.
Alexander Calder was a prolific artist whose career spanned half a century. He is most renowned for his large colorful sculptures made of abstract forms painted in primary colors. Some of these are mobiles, like the huge one hanging in the central court of the National Gallery’s East Building in Washington, DC, and others are “stabiles” (stationary constructions) like Sandy’s Butterfly which you can see in the sculpture garden at the Museum of Modern Art in New York. Calder explored many of the same themes and concepts throughout his long career, using primary colors and geometric and anthropomorphic forms to create abstract structures and images as well as figurative works of subjects from the circus, animals, and celestial evocations among others. He worked in a wide variety of media, painting with gouache on paper, making lithographs, and constructing sculptures large and small with metal and wood. He made jewelry and designed theater sets. We are fortunate to have several examples of the variety of Calder’s work in our January 27 Fine Art auctions. On offer are lithographs (Lots 53 and 54), a sketch for the design of acoustic panels for a theater (Lot 438), a painting of a scene from the circus (Lot 439), and a tiny, jewel box stabile (Lot 440). Calder made all of these after 1950. By then, he had maintained a successful career as an artist for over 20 years. He was respected by his peers, recognized by cultural institutions, and sought after by public and private patrons. Eager to collaborate with Calder, architect Carlos Raúl Villanova approached the artist with a commission to make a large mobile for the lobby of a theater Villanova was designing for the Universidad Central de Venezuela. Calder convinced Villanova to let him create something for the interior of the auditorium, named Aula Magna, instead, and set to work with the acoustical consulting firm, Bolt, Beranek and Newman, on a plan for large round and oval acoustic reflectors. These panels, painted in primary colors, would hang from the ceiling and be affixed to the walls of the auditorium. As a memento of their partnership, Calder gave a study for the design of Aula Magna (Lot 438) to his primary collaborator on the project, Robert Newman, a professor at M.I.T. and a scholar of physics, architecture, and acoustics. Calder returned throughout his career to the themes of balance and movement. This interest is most obvious in his kinetic sculptures and mobiles, but can also be found in the distribution of objects and space in his paintings, drawings, and prints. Calder first studied mechanical engineering before entering art school. That early interest and education in structure and design, coupled with his fascination with the feats of balance and movement he observed at the circus, informed all aspects of his artwork. His first great success was with a miniature kinetic circus, complete with balancing acrobats and a roaring lion, that he began working on in 1926. 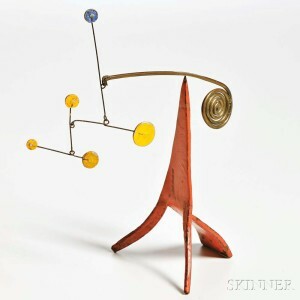 Called Cirque Calder, the creation is now in the collection of the Whitney Museum of American Art in New York. 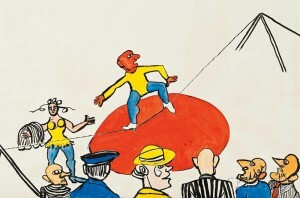 Forty-eight years later, Calder was still thinking about the circus, and made Profils (Lot 439), a gouache painting on paper of a tightrope walker struggling to maintain his footing and the audience witnessing the act. Engineering skill and delicate balance can be found in all of Calder’s work, but none display these notions more clearly than his moving sculptures. The scale of these works varies widely, and he often made small maquettes (three-dimensional models) as part of the design process for large sculptures. He meant the majority of his small sculptures, however, to be artworks in their own rights, like the example in our Fine Paintings & Sculpture auction (Lot 440). Calder’s first mobiles, made in the 1930s, moved via a system of cranks and motors. He eventually abandoned these mechanics in favor of an ingenious system of weights and counterbalances that allowed his creations to move freely when suspended, powered only by slight air currents affected by light, humidity, and even human interaction. The small work in our sale is a delightful example of Calder’s whimsical, yet perfectly calculated structures. Despite the skill and creativity required to design such objects, Calder never lost the sense of playfulness and fun that embodies his œuvre. His works appeal first for their fun, cheerful colors and shapes—something about which Calder was proud. Only on second glance does a viewer make note of the mechanical ingenuity necessary for their creation. This entry was posted in Blog and tagged abstract art, Alexander Calder, art auction, Aula Magna, boston, drawing study, fine art, fine art auction, Kinetic Art, mobile, modern art, Modernism, painting, printmaking, sculpture, skinner, skinner auctions, Stabile by Kathleen M. Leland. Bookmark the permalink.